As the most sweeping change in K-12 school funding in decades, the new school finance system that took effect this month will require school officials to clear their minds of old formulas and assumptions and to think anew in constructing their budgets. That’s the advice of School Services of California, a Sacramento-based consulting firm that is giving budget seminars around the state this week for school officials. For most of the hundreds of school officials at the Sacramento Convention Center on Tuesday, the session was their first exposure to the Local Control Funding Formula, which the Legislature passed last month with significant changes from Gov. Jerry Brown’s proposal in May. With the passage of LCFF in doubt mid-June, most districts passed 2013-14 budgets conservatively, using last year’s revenues and assumptions. This year they’ll start to feel the impact of LCFF’s new formula. Next year, they’ll create their first budgets knowing ahead of time the rules and their allocations, which will vary from district to district. The intent of LCFF is to simplify an unwieldy and illogical funding system based on decades of outdated, complex funding streams. It will shift the focus from funding dozens of state-mandated programs to funding based on local district control and student needs, with substantial extra dollars allotted to low-income children, foster youth and English learners. The distribution of additional money (in green) under the Local Control Funding Formula when fully funded. The district at left, with no high-needs students, will receive additional increases only in base funding, totaling $8,000 per student. The district in the middle, where 60 percent of its students are high-needs (about the statewide average) will receive $9,100 per student. The district at right, with 100 percent of its students high-needs, will get $11,300 per child. The orange band shows what districts will get this year, the first of a projected eight year phase-in period: $180 per student for districts with no low-income children, foster youth and English learners; $312 per student for districts with the statewide average; and $576 per student for districts with only high-needs students. Source: School Services of California, Inc. If fully implemented in 2020-21, as proposed, the LCFF will bring uniformity and predictability to school finance; districts with similar populations of high-needs students will receive the same per-student funding, for the most part. But the transition will be complex. “The LCFF is a really good model, but during the implementation phase, there will be a lot of anomalies, with unintended consequences,” said School Services Vice President Robert Miyashiro. At full funding, districts with all high-needs students will get about $3,000 more per student than districts with none or only a few: $11,300 vs. $8,000 (see School Services chart). As LCFF is rolled out over eight years – in increments of about 12 percent per year – each district will get a different increase per year, depending on the proportion of high-needs students they serve. This year, with $2.1 billion in new money funding the first phase, some districts with mostly high-needs students will get nearly a double-digit increase in per-student funding ($576 per student on average) while others will see only 2 or so percentage points ($180 on average). Those districts with close to the average proportion of targeted students – about 60 percent – will receive about $316 more funding per student. What will matter is not the overall annual increase under Proposition 98 but the unique impact of the LCFF formula for each district, Miyashiro said. A danger is that the public and teachers will believe all districts receive the same amount and press school boards to increase spending based on high expectations. Gov. Jerry Brown resisted pressure from the Legislature to up Department of Finance revenue projections for 2013-14, and so the state budget uses a conservative forecast. School Services is also predicting higher revenues – $3 billion – this year, which then carries through to 2016-17. School Services says it would be risky to assume these healthy increases will then continue for an additional four years, without a recession or economic setback. Brown assumes eight straight years of good revenues will enable full funding of the Local Control Funding Formula in 2020-21. Source: School Services of California, Inc.
What districts should feel confident in – at least during the next several years – is the state’s healthy K-12 revenue projections, School Services said. But, in building their budgets, they should be very skeptical of the state’s forecast that the Local Control Funding Formula can be fully funded in eight years. They shouldn’t make long-term commitments based on that assumption, School Services said. “Be cautious in budgeting the out years,” said School Services President John Gray. Full implementation assumes what has never happened: eight straight years of growth averaging 6 percent. “We’ve had three years, but not eight,” he said. Besides economic recessions, world cataclysms and stock market downturns, the passage of Proposition 30 last November adds a new degree of unpredictability, Miyashiro said. While it stabilized state finances and will provide an average of $6 million per year to the General Fund for seven years, Prop. 30 primarily raises taxes for the top 1 percent of wage earners. Basing a state budget on the actions and decisions of relatively so few earners adds volatility to an already unstable tax base, Miyashiro said. Based on conservative numbers for next year, the Department of Finance is projecting that the General Fund will increase from $97 billion this year to $116 billion in 2016-17. The portion for Proposition 98, funding K-12 and community colleges, would rise from $55.3 billion to $65.5 billion. School Services, in consultation with economist Brad Williams of Capitol Matrix Consulting, is predicting higher General Fund revenue: from $100 billion this year rising to $119.7 billion in 2016-17. There is about a three-in-five chance that state revenues will exceed Finance’s forecast, and a two-in-five chance it will fall short, Williams concluded. The LCFF should prompt districts to redefine risk and recalculate how much they will need in reserve, Gray said. Under the old system, districts were required to keep between 1 and 3 percent of their budget as a reserve, with smaller districts building a larger reserve. With so much uncertainty over funding – and the passage of Prop. 30 last year – some districts accumulated larger reserves. With the shift to LCFF, districts with the most high-needs students, expecting the biggest increases, paradoxically should build the biggest reserves, Gray said. They’ll be the ones most vulnerable if revenues vanish, and if they’ve added staff and increased pay. 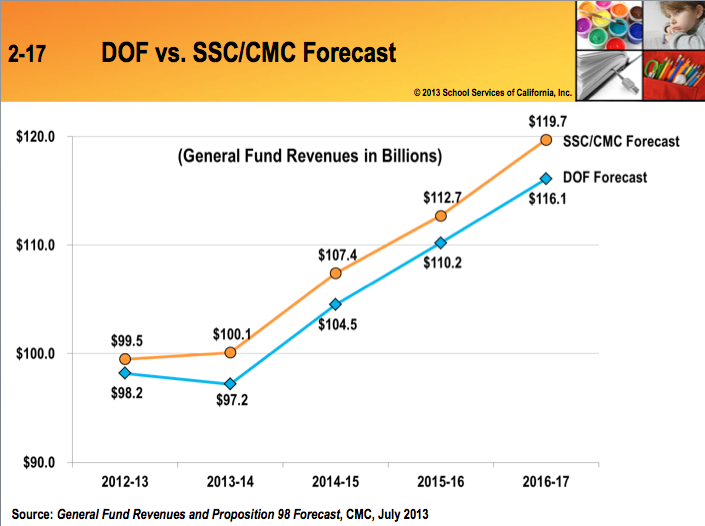 btw, one point about how LCFF ‘compares’ to earlier funding models. In the earlier models, there was a deficit factor (last year 22% I think; as high as 28% in an earlier year) applied to the revenue limit. In theory, that money was always to be paid back, however, it appears with the implementation of LCFF, that deficit now dissolves into thin air, which means it likely will never be paid back (ironically prop 30 was argued to be a way to pay this down). Since the ‘payback’ is based on prop 98, I guess one could still assume an increases in lcff might simply be paying down that deficit (albeit in another name). it would be good if this could be clarified. 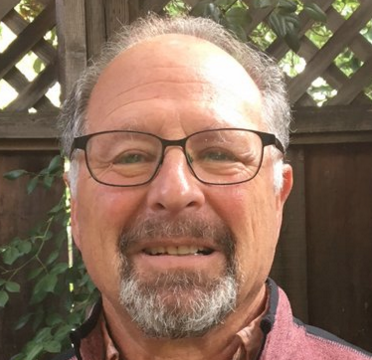 Local experts seem to agree that it will simply now never be paid back (the implication is of course that when that deficit is applied, lcff probably isnt even any more money (and maybe even less than was supposedly owed in the old model–I guess the reason for the hold harmless clause?)). Then another point is we seem to be assuming a regularly increasing slope to full funding (ie circa 12%/year), but there is no reason this number could not be ‘adjusted’ the same way the deficit factor was used in previous years, ie, we dont have enough money, so you dont get yours. Will this version of the deficit factor have the same rules as the previous one? navigio:The target figures for the base funding at full funding under LCFF (the amounts differ by grade) do assume the repayment of the deficit factor amassed since 2007-08 on the AVERAGE revenue limit. COLAS will be added to those amounts moving forward, starting this year. Now, there are 230 districts — those with few high-needs students and those with historically high revenue limits — that would not return to levels of funding in 2007-08 if the cuts in 24 percent categoricals also are added. For some of these districts, the formula includes a feature called the Economic Recovery Target, that will act as a hold-harmless supplement. I haven’t gotten into this. The LAO new analysis explains this. Go about a third of the way down in the online report. Thanks John, yes it does. The ERT section seems pretty specific in indicating that the deficit factor will be ‘retired’, so I guess districts haven’t gotten the message yet. But it is interesting that this essentially does away with the value of LCFF for about 13% of our districts (another 10% would have qualified, but will likely get hold-harmlessed instead, ie lose money as compared to 07-08), at least to the extent ‘the value’ meant seeing any increase in funding. So that seems to imply about a quarter of districts will get equal or less than 07-08, COLA-ed funding. I am trying to imagine which kinds of districts would get ERT, but its a bit difficult to do. The deficit factor impacted poorer districts disproportionately, and those would also have been more affected by categorical shortfalls, but they are of course going to be the biggest benefiters of the supplemental grants. It would be cool if someone listed these districts, or at least quantified where they fall on the spectrum. Anyway, figure 6 about halfway down is a good graphic on seeing how this progresses over years. It is interesting to note that the other hold harmless section does not seem to take deficit factors into account, but again, those are richer districts, who were much less impacted by the deficit factor and probably had fewer categoricals. I should have included this link to a document I have posted. The last column indicates which districts would qualify for the Economic Recovery Payment; perhaps a pattern will emerge. I thought you might be interested in the blog linked to below that was published in the Huffington Post today. It’s message is quite consistent with that contained in your article. The points I made would have been more powerful when backed by the specific data you provided. As School Services of California apparently implied in their seminars, good is not good enough. It is very difficult to develop an average using only one student per grade span. But doing it that way I also get $7,540. A very slightly more accurate way is to put one student in each grade level in K-12, add them all together and divide by 13. Then I get an average of $7,646. Of course if there are fewer grades in your district (maybe K-8 or 7-12) the average will be different for you. John it was nice to meet you at the SSC Conference. Keep up the good work! School Services is on the road, so I will venture some comments. Rob: Did you include the 10.4 percent add-on for class size reduction for K-3 and the $215 per student for career technical education add-on for 9-12? That could make a big difference and raise the total. Manuel: The title of the School Services chart may not be clear enough, but the $8,000 figure you cite is for a district with no targeted students at full implementation, in eight years. Only the yellow band of $180, added to $6,500 bringing the total to $6,680, applies to 2013-14. The figures that you cite are the base spending amounts at full implementation, not 2013-14, to which a district’s supplemental and concentration amounts are added. (A) Six thousand eight hundred forty-ﬁve dollars ($6,845) for average daily attendance in kindergarten and grades 1 to 3, inclusive. (B) Six thousand nine hundred forty-seven dollars ($6,947) for average daily attendance in grades 4 to 6, inclusive. (C) Seven thousand one hundred ﬁfty-four dollars ($7,154) for average daily attendance in grades 7 and 8. (D) Eight thousand two hundred eighty-nine dollars ($8,289) for average daily attendance in grades 9 to 12, inclusive. The extra 10.4% for K-3 is in (3)(A) and the 2.6% for 9-12 in (4)(A). Therefore, unless I am in some parallel universe, this is the “base” for the whole process. In fact, (2) says that these amounts shall be adjusted for COLA in subsequent years. BTW, if I am wrong, then there is a major problem as this “base” is about the same as the “base” calculated by LAUSD prior to LCFF based, pressumably, on SSC’s projections based on the good ol’ formula. If that’s not the case I expect major discussion on funding problems at the next LAUSD Board meeting. Manuel: That certainly appears to be an accurate reading of the LCFF statute. I’ll see if the Department of Finance can straighten me out tomorrow. As you mentioned earlier, averages create problems in understanding the formula. Every district is guaranteed no less than the 2012-13 level for the revenue limit and categoricals included in the formula. Because of TIIG (desegregation dollars), LAUSD starts at a high base, according to a document comparing some districts that DoF published last month. 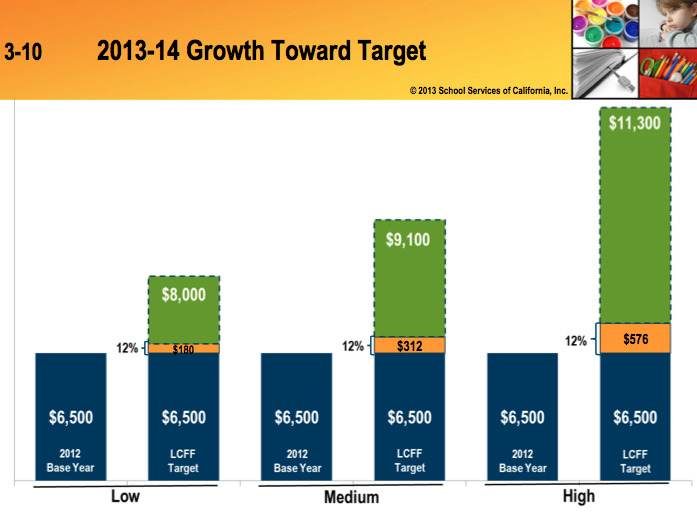 LAUSD’s base for 2012-13 is $7,738, about $1,000 per student higher than Long Beach, with similar students. The 2013-14 per student funding for LAUSD is $8,102. Thank you for the confirmation, John, as the last time I tried to interpret Ed Code language I got it wrong. 3) 42238.02(f) again uses this “need ratio” to calculate the concentration grant. As I said above, the average base grant/student for LAUSD using this formula and the enrollment numbers from CALPADS together with the ADA for the District (published by LAUSD in their budget and excluding fiscally independent charters) is $7,159 (the difference between the number I give above and this one is using 0.9833 instead of 0.98). This is $1,000 lower than the average published by DOF for the base grant in 2013-14 (if that’s what it is). But now the gravy is significantly larger (nearly $1.5 billion!) so you can imagine the “negotiations” that will take place. To give you an idea of the current state of affairs, the 2013-14 LAUSD budget shows that the overhead rate is around 70% when special education costs are excluded. This is extremely high and I am concerned that a good portion of the “new” money will be swallowed by the overhead. I’d be happy to share with you my analysis of the published budget that leads me to this conclusion. if there is one thing districts seem to do in a timely manner, its attendance; probably because funding depends on it. i expect grade ada rates are available at least on a monthly, and maybe even daily basis. our district published monthly reports of ada rates for each school, for example, though obviously not by grade. i expect you’re right that they will now have to do that as the grades determine funding (actually, in the old system, that was true to some extent already in secondary). that said, many of these methods of per-student funding use more than just ‘current’ ada. some programs use ada from the previous year, or the max of the previous and an earlier year, etc. some may even try to do it on a real-time basis, but this is difficult to do given that cbeds day isnt till october. i havent noticed whether this new funding method uses something like this or not. anyone? As you noted, the figures you cited are the statutory grade-level base funding levels for 2013-14. BUT, as I expected, there is not sufficient money now to fund them. They will reach that target level, through incremental funding, over the next eight years (or however long it takes to reach full funding). The next section of the law you cited — 42238.03 — explains this. So, why write into statute now base funding levels that will take eight years to reach? According to Chris Ferguson of the Department of Finance, it’s an equity issue. Think of it this way: Every district is guaranteed to get no less in funding than it received in 2012-13. So each district’s base funding, starting off, is different and will move, in the transition, at different rates toward the target base funding levels that you cited. To ensure that every district receives the same amount in cost of living adjustments every year (as they roughly did in the past, with revenue limits), the COLAs will be based on the 2013-14 base funding levels. (A district’s extra money for high-needs students, the supplemental and concentration dollars, will also get COLAs.) Chris said that legislative leaders pushed for this approach during negotiations to ensure more uniform yearly rate increases for all districts. On another point raised in the discussion, ADA, a district’s daily attendance figures on which funding is calculated, is reported and distributed grade by grade, not done on a district’s attendance divided by 13 for each grade. FYI, the cde is having a number of public sessions around the state to solicit input from the community on the implementation details of LCFF. I believe this happens around the middle of August. Ideally, the community would actually understand LCFF before it tries to comment on it. 😉 A plain english description could contribute to that but would obviously need to be done ahead of those dates in order to achieve that. navigio: Can you point us to a link with the dates and locations of the sessions? Oh, and as I mentioned in a few earlier comments, I really think the definition of dollars needs to be extraordinarily clear. Inflation causes a greater number of them to be equal to a lesser number of them at some time in the past. From that perspective, a number increase could actually represent a value decrease. This was not clarified in earlier infographics. John, thank you for the clarification. While your expectations are reasonable given your experience, that is not what the mythical “taxpayer on the street” thinks. The public believes, correctly, that they voted for more money for schools that would be available in 2013-14. The Legislature reportedly worked a compromise that assured the public that funding would go up from the first year that the public started paying more taxes. Why did the Legislature promise a set of amounts that the state cannot deliver? Why didn’t the Legislative Analyst Office make a big deal of this? Why didn’t the DoF report that this “compromise,” which Gov. Brown signed, would not be met? At any rate, my examination of LAUSD’s expected budget state contributions for 2013-14 shows a very modest increase over 2012-13 and it actually is slightly higher than what the base amount yields (after subtraction of local property taxes). If the base amount for 2013-14 is less than what is described in 42238.02, then LAUSD will be getting less than last year contrary to DoF’s assertion. I hope I am wrong because if I did not make any error in my comparisons, then things will get very interesting indeed. As for the ADA, well, as Navigio has pointed out, they could be calculated on real time, but they could certainly be calculated based on previous year attendance per grade as the data exists. Those numbers, of course, are unknown to all because DataQuest reports enrollment not ADA. That reduces the ability of anyone willing to watchdog the process. Incidentally, this was never included in the projections made by DoF and disseminated by you. A moving target, eh? From my perspective, the governor and the popular press forthrightly disclosed the originally proposed seven-year and finally agreed eight-year funding schedules. The differences in elementary and high school funding were discussed in general terms. I also saw some coverage, both before and after the election, explaining that Proposition 30 merely prevents further cuts/satisfies baseline budgetary commitments. The completely arbitrary nature of the eight-year compromise disappoints me. Nevertheless, the LCFF plan offers school districts more certainty about funding than they have enjoyed at any point since 2007-2008. As long as education funding depends so heavily on personal income tax revenue — including the state capitals gains tax and a (temporary!) surtax on high-income earners (Prop. 30) — there will never be absolute certainty from one year to the next. I don’t think much more can be done, given California’s electoral climate. Did you take into account that each amount is for a different number of grades? When I add up all those amounts (assuming one kid in each grade)and average them, I get $7645. I just did the dumbed-down approach: added them and divide by 4. That works out to $7,541. Of course this makes no sense because the amount is for different students. The proper way would be to define the number of students in each grade in an average district and then calculate the average overall by dividing the total funding received by this mythical average district by the total number of students. But this is, really, a silly exercise as all districts are different. How did you get to $7645? Anyway, this demonstrates that just quoting a number means nothing unless the reader is informed what method was used to arrive at said number. Especially when the average is greater than all but one of the elements of the sum. An interesting article because it highlights, as John puts it, that averages can be deceiving. For instance, the average funding per “not needy” student for 2013-14 calculated by SSC is $8,000. Averaging these four amounts does not give me $8,000. So how does SSC calculate even the simplest average? Does it assume a particular student population to get this average? Is it a proprietary algorithm? I know for a fact that categorical funds never showed up in the official on-site school budgets at LAUSD on the grounds that they were categorical even though they were, by and large, used to supplant, not supplement, the base budget. So how will the public know where the funds are being used? Indeed, it will require that “school officials … clear their minds of old formulas and assumptions and to think anew in constructing their budgets.” The bigger question is whether or not they’ll tell the stakeholders. Expect big fights with the unions serving the districts over where the money is going. That’s already been made clear at the last three meetings of LAUSD’s Board. Fireworks coming. Bring popcorn and a lawn chair. And some good beer, if so inclined.